A conductive polymer, poly(3,4-ethylenedioxythiophene):poly(styrene sulfonate) (PEDOT:PSS), was modified with dimethyl sulfoxide (DMSO) in solution state, together with sub-sequential thermal treatment of its spin-coated film. The electrical conductivity increased by more than three orders of magnitude improvement was achieved. The mechanism for the conductivity improvement was studied at nanoscale by particle size analysis, field emission scanning electron microscopy (FESEM), and X-ray photoelectron spectroscopy (XPS). Smaller particle size was observed, resulting in larger contact area and better electrical conductive connections. Connection of conductive PEDOT increased on the surface of the PEDOT:PSS particles, which promoted high conductivity. Flexible anodes based on the modified PEDOT:PSS were fabricated. Flexible organic light-emitting diodes (FOLED) based the polymeric anodes have a comparable performance to those on indium–tin–oxide (ITO) anodes. Conjugated conductive polymers have seen prosperous applications, e.g., printed sensors or timers, electronic newspaper, wearable electronics, and displays. Poly(3,4-ethylenedioxythiophene) (PEDOT), a derivative of polythiophene, firstly developed by Bayer AG research laboratories, shows excellent transparency in the visible region, good electrical conductivity, and environmental stability . However, PEDOT prepared by using oxidative chemical or electrochemical polymerization methods is found to be insoluble and therefore difficult to process in thin-film form or other shapes . Water soluble PEDOT:PSS was achieved by using a water-soluble poly(styrene sulfonic acid) (PSS) as the charge-balancing dopant during polymerization , which is a system with good film-forming properties, high visible light transmittance and excellent environmental stability. It has been successfully used in anti-static coating and organic optoelectronic deices etc. [4–7]. PEDOT:PSS electrodes are good candidates to replace brittle indium tin oxide (ITO) electrodes for the fully flexible electronic devices, except their lower conductivity [8, 9], as the high Joule heat generated by the current flowing through the organic electrodes impairs the performance as well as the lifetime of the devices. Grain-like structure was reported on spin-coated PEDOT:PSS films, in which the PEDOT core was surrounded by a thin layer of PSS shell with a non-homogenous distribution of the PEDOT and PSS species in a single grain . This core-shell structure is likely to limit the conductivity, as commercially available products have a conductivity of 1 S/cm (Baytron P, Bayer Corporation), which limits its application in optoelectronic devices. Recently, efforts have been focused on improvement of electrical conductivity of PEDOT:PSS films. Electrical conductivity of PEDOT:PSS can be enhanced by acidic and thermal treatments. Improvement was achieved by adding small amount of solvents with high boiling temperature such as dimethyl formamide (DMF), dimethyl sulfoxide (DMSO), glycerol, and sorbitol, etc. [11–14]. Conformational modification, morphology modifications, and reduction of the Coulombic interaction by a screening effect were proposed to explain the conductivity improvements [13, 15–18]. In this letter, PEDOT:PSS was modified with dimethyl sulfoxide (DMSO) in its solution state, followed by thermal treatment on the spin-coated films to improve its electrical conductivity. The mechanism of the improvement was investigated by particle size analysis, field emission scanning electron microscopy (FESEM), and X-ray photoelectron spectroscopy (XPS). Flexible PEDOT:PSS anodes were fabricated to replace ITO in flexible organic light-emitting diodes (FOLED). FOLEDs based on the modified PEDOT:PSS anodes have a comparable performance to the those on the ITO anodes. Poly(ethylene terephthalate) (PET) films with a thickness of 175 μm (DuPont Teijin Films/Melinex®ST506) were adopted as the flexible substrate. The PET substrates were sequentially rinsed in four ultrasonic baths: non-ionic detergent, de-ionized (DI) water, acetone, and isopropyl alcohol, each for 10 min, respectively. The substrates were then dried in a vacuum oven for 12 h at 60 °C. At last, the substrates were treated by mild O2plasma for 8 min. DMSO, with a weight concentration of 3, 5, 7, and 9%, respectively, was added into the aqueous PEDOT:PSS (BAYTRON®PH 500) and mixed uniformly under ultrasonic condition for 10 min. Films of DMSO modified PEDOT:PSS were fabricated by the spin-coating method. Then the spin-coated films were baked at 100, 130, 160, and 190 °C, respectively. The sheet electrical resistance of the films on PET substrates was determined with the four point resistivity measurement. The particle size of PEDOT:PSS in solution state was examined by a particle size analyzer (LS 13 320, Universal Liquid Module, Beckman Coulter Inc.). 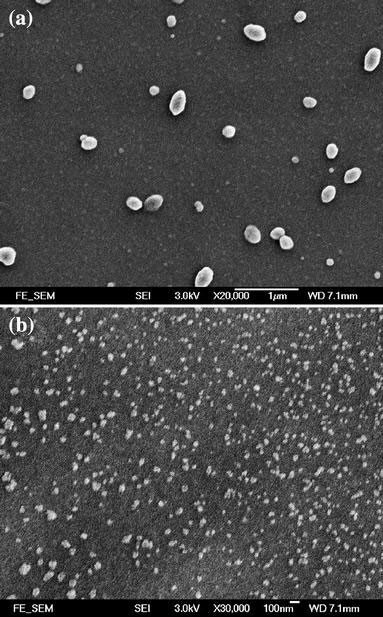 Single particles of PEDOT:PSS were examined by FESEM (JEOL, JSM-6335F). XPS analysis was performed using a Physical Electronics 5600 multi-technique system, with a base pressure of 1 × 10−10 Torr (ultra-high vacuum) using monochromatic AlKαX-ray source, at hv = 1486.6 eV, with a resolution of 200 × 200 μm. The take-off angle was varied from 45° to 25° to obtain the chemical information in different depth nearer the surface region. 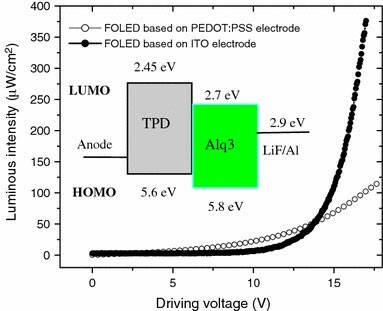 Double layer FOLEDs with a hole transport layer of TPD and emitting/electron transport layer of Alq3film sandwiched between DMSO modified PEDOT:PSS anode and a LiF/Al cathode. FOLEDs based on a PET coated with ITO anodes (CPFilms Inc., a sheet resistance of 120 ohm/□) were fabricated for reference. 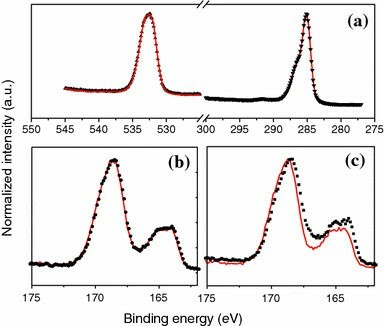 The TPD, Alq3, LiF, and Al films were deposited under a vacuum of 2 × 10−6 Torr with a deposition rate of 0.5, 0.2, 0.3, and 0.5 nm/s, respectively. The effective size of the devices was 10 mm2. The voltage–luminescence (V–L) characteristics of the FOLEDs were measured using 814 photomultiplier detection system (Photon Technology International) under ambient environment at steady-state. The sheet resistance of PEDOT:PSS modified at various DMSO concentration and treatment temperature is shown in Fig. 1. The sheet resistance of PEDOT:PSS films dramatically decreases from several M-ohms to several hundred ohms after the modification processes. The electrical conductivity increases by three orders of magnitude. With increasing DMSO concentration, the electrical conductivity of the films reaches a relatively stable value with at a DMSO concentration above 5%. A sheet resistance of 200 ohm/□ PEDOT:PSS electrode on PET is obtained with a DMSO concentration of 5% and a thermal baking for 10 min. 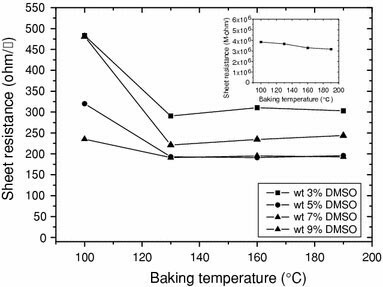 If the DMSO modified films are dried at room temperature no further baking or only the pristine PEDOT:PSS baked at elevated temperature, no conductivity enhancement can be observed, which indicates that both the DMSO and baking are necessary for the electrical conductivity enhancement. Particle size distributions of pristine PEDOT:PSS solutions and the modified ones are shown in Fig. 2. 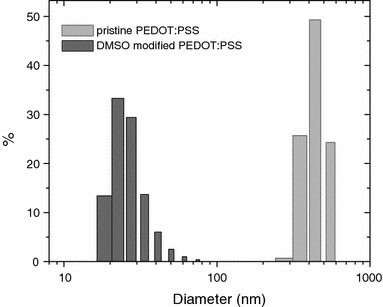 The mean size of the PEDOT:PSS particles decreases from 444 nm to 27.6 nm after the DMSO modification. The PEDOT:PSS particle without any treatment should be about 30 nm [http://www.baytron.com/], which indicates that the smaller PEDOT:PSS particles amass into larger ones in its aqueous state. The amassed particle is broken into smaller ones during the modification process. The particle size analyzer results show a very good agreement with the micrographs obtained from the FESEM, as shown in Fig. 3. The size of pristine PEDOT:PSS is 100–400 nm, much larger than 30–100 nm obtained after the modification. The PEDOT:PSS particles become much smaller and more uniform after the modification, thus increase the contact area between the PEDOT:PSS particles, resulting in the conductivity improvement. In the solution state, the ion-band between the PEDOT and PSS may be even weak. Molecules of the solvent may diffuse into the PEDOT:PSS particles, and molecule chains between PEDOT and PSS. The bonding of PEDOT and PSS particle is released and large PEDOT:PSS clusters are broken and rearranged, in a result that smaller particles are obtained. During the process, a higher temperature is required to remove the solvent from the films and keep the configuration unchanged, just like the heat-setting process of polymers at a higher temperature. The O(1s), C(1s), and S(2p) core level spectra of pristine PEDOT:PSS and DMSO modified PEDOT:PSS films are shown in Fig. 4. Figure 4a, b shows the O(1s) and C(1s) core level spectra of the pristine and DMSO modified PEDOT:PSS films. The peak at 532.5 eV originates from the oxygen atoms in the double bond to the sulfur atoms in the PSS chain, the peak at 533.5 eV corresponds to oxygen atoms from PEDOT chain . The C(1s) core level spectra have two main features, a strong peak at 285.0 eV, and a shoulder at 286.5 eV . The peak at 285.0 eV corresponds to the saturated and conjugated carbon atoms from the PEDOT and PSS chain. The shoulder at 286.5 eV comes from C–O–C bonds in PEDOT chain. The DMSO does not induce any significant changes in the banding energy of O(1s) and C(1s), which indicates that no chemical reaction occurs during the modification and thermal treatment. The bigger the take-off angle, the deeper the chemical information can be obtained. In PEDOT and PSS chain, both have one sulfur atom in one repeat unit. The sulfur atom from PEDOT has a different chemical condition from the sulfur atom from PSS, resulting in different S(2p) binding energy so that the composition of the PEDOT:PSS from various depth can be analyzed . The S(2p) core level spectra of pristine PEDOT:PSS film and DMSO modified PEDOT:PSS film are shown in Fig. 4b, c, with a take-off angle of 45° and 25°, respectively. The S(2p) core level spectra of the pristine PEDOT:PSS and modified PEDOT:PSS film at the two take-off angles have identical peaks, around 168.5 eV and 164.0 eV, corresponding to sulfur from PSS and PEDOT. At a take-off angle of 45°, the pristine and the modified PEDOT:PSS films exhibit no difference. On the contrast at a take-off angle of 25°, the relative intensity S(2p) of sulfur from PEDOT increases, which indicates that conductive PEDOT concentration increases at the surface of the PEDOT:PSS particle, which is preferred for high conductivity. Particles with higher conductivity and better contacts are formed, resulting in the three orders of degree conductivity improvement by the DMSO modification and thermal treatment. The voltage–luminous intensity of the FOLED based on the DMSO modified PEDOT:PSS and ITO anodes is shown in Fig. 5. The FOLEDs based on the PEDOT:PSS anodes have a lower turn-on voltage (at a luminance of 1 μW/cm2) of 4.3 V, which is much lower than 7.2 V obtained from that with ITO anodes. The FOLEDs based on the polymeric anodes have a higher luminous intensity than those based on ITO electrodes below a driving voltage of 14 V. PEDOT:PSS has a higher work function than ITO, decreasing the energy barrier between the anodes and the hole transport layer in the FOLEDs. Holes can be more easily injected from the anodes, resulting in the lower turn-on voltage and higher luminous intensity of the FOLEDs. In this letter, PEDOT:PSS was modified with DMSO and sequential thermal treatment. The mechanism for the conductivity improvement was studied with particle size analysis, FESEM, and XPS. Concentration of PEDOT and PSS was found to redistribute in the modification process. PEDOT concentration increases on the surface, which enhances electrical conductivity. In addition, electrical conductive particles with smaller size and more uniform, better packing and bigger contact area facilitate in better electrical connection. Three orders of magnitude enhancement in conductivity was achieved with the modification process. Based on the modified polymeric anodes, FOLEDs were fabricated and compared with the FOLEDs of ITO anodes. A lower turn voltage and higher luminous intensity were achieved. These FOLEDs based on the modified PEDOT:PSS anodes have a comparable performance to those of ITO anodes. The authors thank Research Grant Council for funding support (No. Polyu5286/03E). Dr. Wang acknowledges a postgraduate scholarship from the same source.